Many thanks to Jon Tedesco and Dr. Dean Giliard (the ultimate insiders) for all their help. How dare I discuss the story of a Chevrolet by starting with a Ford and Chrysler executive! But, if you bare with me, I think you will enjoy this story. The words in the box below are paraphrased from the autobiography IACOCCA by Lee Iacocca. This story began with one man's daydream. When Lee worked as vice-president of the Ford car and truck, and Lincoln-Mercury groups in the mid 1960s, he had the problem that the Lincoln cars were outsold by Cadillacs many times over. One sleepless night he got the great idea to put a Rolls Royce grill on a Thunderbird. He remembered the classic Mark I and Mark II cars Ford had built in the 1930s and 1950s. Lee figured most people dreamed of having these cars, though few could afford them. He decided that the Mark should be reborn as the Mark III. The result had a very long hood, a short rear deck, and a powerful V-8 engine. Introduced in the middle of the 1968 model year, the new Mark III made Ford's long-range goal of outselling the Cadillac Eldorado that very year. Lee related that bigger cars made bigger profits. Even in a recession the rich people still get richer, so you have to have something for them, too. This was a time when people wanted to convey the look of prestige with their cars. I remember when I first saw the Lincoln Mark III cars, I wondered how they could get away with that grill without Rolls Royce complaining about being copied. But, I loved the look. And, I also remember seeing VWs with Rolls Royce grills on them. But, those just made me laugh. When you see the VW Rolls Royce that Liberace had, it makes you wonder if this is what he was driving while he was laughing all the way to the bank. In the movie Up in Smoke, Tommy Chong's character leaves his wealthy parent's house and climbs into his car. The camera is zoomed in on the authentic Rolls Royce grill. As the camera pans back, you see the grill is just banded onto the front of his old banged-up Volkswagen Beetle. Even Cheech Marin's character, Pedro, has a winged hood ornament on the hood of his 1964 Chevy low-rider. But, that movie came out in 1978. This story starts a few years earlier. An article in a 1976 issue of Motor Trend magazine tells a lot about the origin of the Custom Cloud. It was titled, "A Rolls is a Rolls is a Rolls...(unless, of course, its a Chevrolet!)." In April of 2008, I finally made contact with Jon Tedesco. Jon is the main man behind the Custom Cloud. In the middle of 2009, Dr. Dean Giliard typed up his recollection of his work with Jon Tedesco, and sent it to me. Also, an owner of two Custom Clouds, Jim Watts, told me some information from several newsletter-type articles. The individual batches of information didn't agree on every detail, but I have consolidated them together as best as I can, in what I hope is an accurate depiction of the true events. The next box relates what Jon, Dean, and the articles told me. Jon Tedesco's father had a printing company in Pennsylvania where Jon worked doing graphic design as a teenager. After graduating high school, he joined the National Guard and relocated to San Jose California to chase his dream of building custom cars. Jon began working for a few custom car builders where he learned more about true metal finishing, painting, and building drag cars. He was part of the team that is credited with building one of the first funny cars, which was a B Altered Anglia that was modified to accept a Ford Mustang body. After a few years, Jon was getting married and thought he should get a real job. He received an offer to be the art director for a religious publisher in Miami Florida. So Jon and his new wife packed their things into their new 1964 1/2 Mustang convertible, and were off to Miami. After about ten months, the desire to be his own boss empowered Jon to make a deal with the publisher. He would continue doing their work, but as an outside contractor with his own marketing, design, and advertising agency. This gave Jon the security of a steady income while allowing him to obtain clients of his own. In the early 1970s, Jon founded the South Florida Street Rods, and Dean Giliard joined the club. Both were building fad model T Ford hot rods. Jon was building his T-touring, and Dean a big-block Ford T-bucket. Like so many hot rod guys, they worked with each other on their cars. 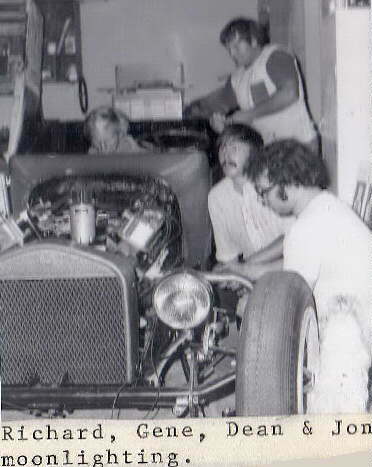 Here's a picture that Dean sent me of Jon, Dean and some friends working on Dean's T-bucket. Many evenings Dean would be over at Jon's helping with the wiring on his T-touring, and Jon was welding up Dean's headers. Jon was the artist and painter, their good friend, Gene, was the metal fabricator and welder, and Dean ran wires. Those evenings were good fun, and they all learned something from each other. 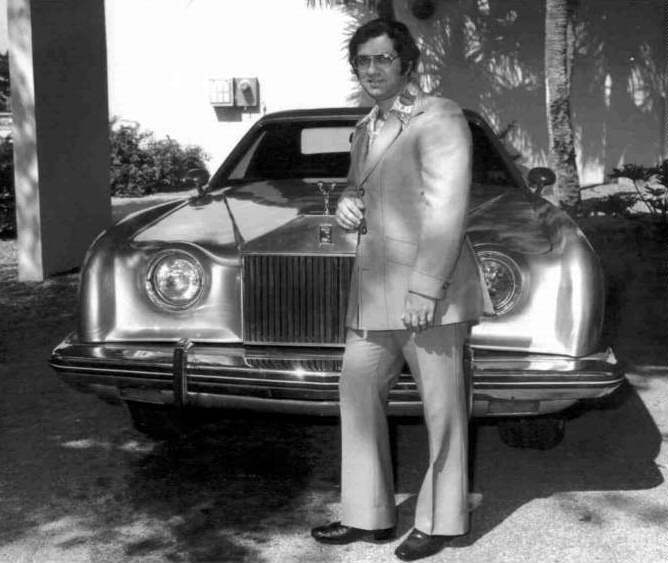 In early 1974 there was a client of Jon's marketing company, Lenny Borger, who owned some hotels in Miami, and other family businesses in South America. 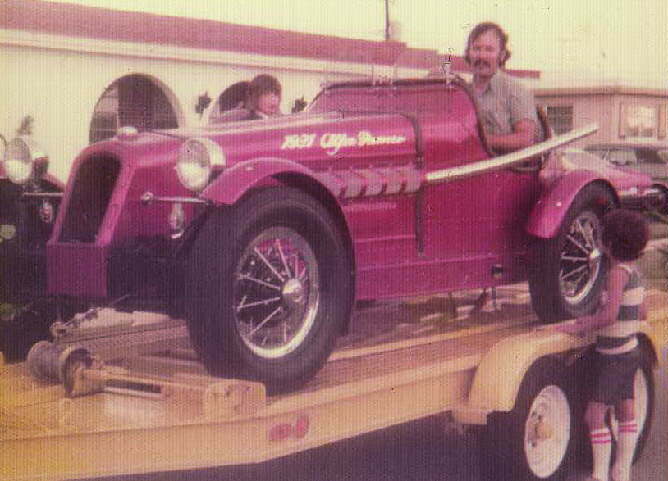 Lenny had a keen interest in the car business and had become a distributor for some fiberglass kit cars that used VW frames and motors. He also started assembling some of the kits for local sales. Jon was assisting him in promoting the kit cars. In those early days the assembly part was not going well. Dean had left his job at a local jewelry company, so Jon asked Dean if he would be interested in helping to build the complete kit cars. Well, after building some of these cars it became evident that the people making the money were the kit suppliers in Buffalo NY. Dean sent me the following three pictures of the VW kit cars. These cars look so good in detail that I had a hard time believing they were kit cars. Then I saw the positive camber (outward lean) of the rear wheel of this one. Recalling my own days overhauling VW trans-axles, I recognised this trait of the VW. Jon did some work for the South Florida Chevrolet Dealer Association which expressed an interest in creating more traffic through their showrooms. He told them he would try and come up with something more creative than having clowns and free hot dogs to attract customers. He went back to his drawing board and came up with the basic idea that if they customized one of their newer model cars, and promoted it properly, a large number of potential customers might come in to check it out. The issue, then, was what kind of a look would work. Jon explored many customizing possibilities (which even included a designer car concept which he later did for Cadillac) and selected the Rolls Royce look-a-like because of the immediate recognition, strong brand, and its prestige known throughout the world. He began to do some design work, and determined he might be able to pull it off on the new Monte Carlo. He named this new car the Custom Cloud. One day Lenny asked Jon what other customers he had, and what projects he was working on. Jon briefly mentioned the Chevrolet / Rolls Royce project, and Lenny got very interested. He wanted to get involved. Jon had begun to dump a lot of money into this project, and he realized it was going to take a lot more. So, he went back to Lenny, and Lenny became Jon's partner and investor. 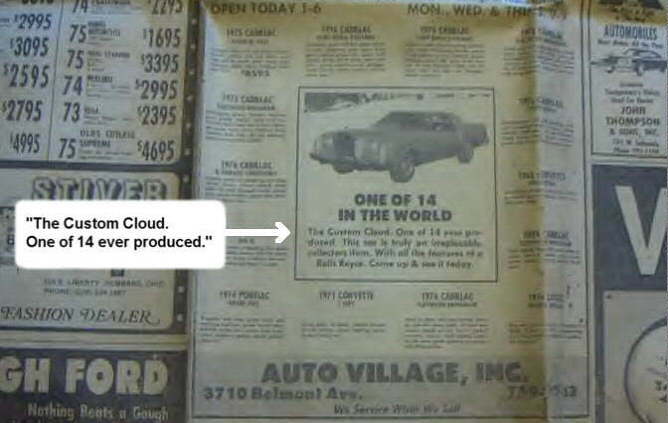 This was when Custom Cloud Motors, Inc. was born. With the new financing Jon rented a warehouse in an industrial area of Miami. One more thing was going on. Lenny was a collector of rare wines, and he wanted to get into the wine cooler business, so they started building wood-insulated refrigerated wine cellars. For these, the compressors were Tecumseh, and Dean was building the wood cedar boxes and cooling units. Jon was in charge of making the ads and promotional brochures for these wine cellars. So, the VW kit car assembling, the wine cooler building, and the new Custom Cloud project were all going on together in the same warehouse. Jon bought a new 1975 Monte Carlo, hired some body-men friends of his, and began to build a mockup of his dream. He and his crew removed all the front sheet metal, purchased an authentic Rolls Royce grill, mounted it on the front of the Monte Carlo, and built new fenders and a hood out of sheet steel and Bondo. The new design complemented, enhanced, and took full advantage of the Rolls Royce grill. Jon was so happy with the result that he then realized they also needed to rework the back of the car. So, they restyled new rear quarters and a deck lid to cover the back. Unfortunately, this made the kits they were going to make a lot more complicated, because the fiberglass rear quarter panels would have to be blended in to the rest of the body and finished with filler. The front fenders of the conversion would be easier to install, because those replacement parts were designed to just bolt on. Jon and his team found out that Rolls Royce never bothered to patent their unique grill in the USA, so at the request of his attorney, Jon got a US design patent (D242,912) on his new car. The thought was, how could Rolls Royce stop him if he owned the patent? The patent was officially filed on September 25, 1975. If you follow the above link, you'll see the patent misspelled Jon's name "John". Shortly after applying for the patent, Jon suggested that they were going to need a production foreman for the manufacturing of the new kits, so they promoted Dean. As soon as Jon finished the design process, Dean began the mold making process and got set up for the other parts fabrication. After the mockup was complete, a release agent was spread onto the new body parts, and fiberglass molds were cast of them. Wood and steel frames were made to support the newly cast molds. Then, the molds were used to make the kit parts. Virtual copies of the Rolls Royce grill frames and tops were jobbed out to a local fabrication shop. Dean built a wood jig to space out the grill bars, and used an electric spot welder to attach the bars to the frame. The new grills were chrome-plated stainless steel. The flying ladies were purchased from a company that provided them to the VW kit company. The front and rear emblems were cast in pewter, then chrome plated, and Dean's wife applied the black-enamel paint to the recessed lettering at their home. Jon searched and found the best existing front bumper for the new car was the one from a 1973 Buick LeSabre. It was decided to use original Rolls Royce (RR) taillights plus the RR rear license plate lights. Later, this would become a problem as they had purchased every RR taillight in the US, so they had to special order a production run from the manufacturer, Lucas, in the UK. Dean still remembers at the time thinking, that if someone in North America had a need for RR taillights, they would have to come to them. It was a small business, and making the molds took so much time that the pictures taken on the beach for the brochures were of a car without the new rear quarters and deck lid. The back-of-the-car pictures were added later. The very first kit was mounted onto a new 1976 Monte Carlo only six months after the project began. The first car was entered in the Miami International Motor Show, held in the Miami Beach Convention Center, which was held in late 1975. For the show, the new hood was not ready, so the 300 pound Bondo model hood was used. They built a special display around the outside of the car, using plywood boxes that were around two feet high, and angled down three feet to the edge of the car. Several rows of florescent lights were attached to the bottom of these boxes. Then, angel hair was placed over the lights, and clear Plexiglas covered these boxes. The effect made the car appear to be floating on a cloud. After the Miami show things were really rolling, and the VW kits were a thing of the past. The new company was going strong. Soon Custom Clouds became available across the country from Chevrolet outlets. The price of the kit was set at $2,395, but the installation was extra, as was the preferred Buick front bumper. The dealerships then discovered that putting the kits on the cars got quite laborious, and so they didn't trust their own body shops to do the job. That left Jon to hunt for a factory to build completed cars in California. What he found was more companies interested in buying the completed cars. When Jon traveled to California he met with the people at Petersen Publishing Company. He told them he hoped his creation could get on the cover of one of their magazines. Later, Car and Driver got back to Jon and told him how he could fulfill his dream. All he had to do was get a Custom Cloud to London, England real fast. 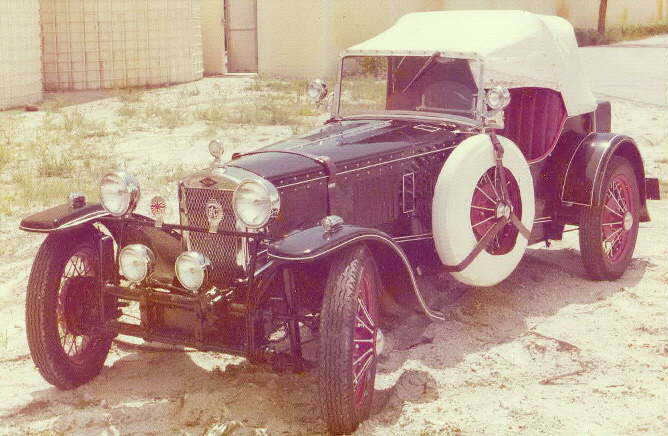 The car shown at the Miami show was sold to a lady from England, named Mrs. Diana Marks who, along with her husband, owned and operated a large and fashionable evening-ware clothing chain serving the Midlands. So, Custom Cloud Motors paid the outrageous cost of freighting the car on an airplane to London. Of course, when the car was shipped, it had all the correct parts on it (not the Bondo hood). Car and Driver arranged for a freelance writer to do an article with assistance from a local photographer. The photographer was to deliver the car from the port to the new owner. For the magazine article the Custom Cloud was paraded around the city streets to see how Londoners reacted to this outrageous masquerade. Some hated it, but others loved it. When the car was driven in front of a Rolls Royce dealership for pictures, the Rolls Royce people quickly asked them to remove it. When they left the car unwatched outside a pub, they came back to find the flying lady hood ornament was stolen off of the car. At the time it was looking like Dean was going to the UK to install a new one. Getting the part there was not a problem, so he wrote up a detailed instruction sheet in order to have a local mechanic shop install the new flying lady. But, in those days there was no Fax or Internet, so a very long Telex was sent with the instructions. In the Car and Driver article, the writer mentions that the Telex was the longest one he had ever seen. Although the article did not appear in Car and Driver until March 1976, the article was penned on December 28, 1975, by Charles Fox. The photographer was Humphrey Sutton, and he actually delivered the car to Mrs. Marks. 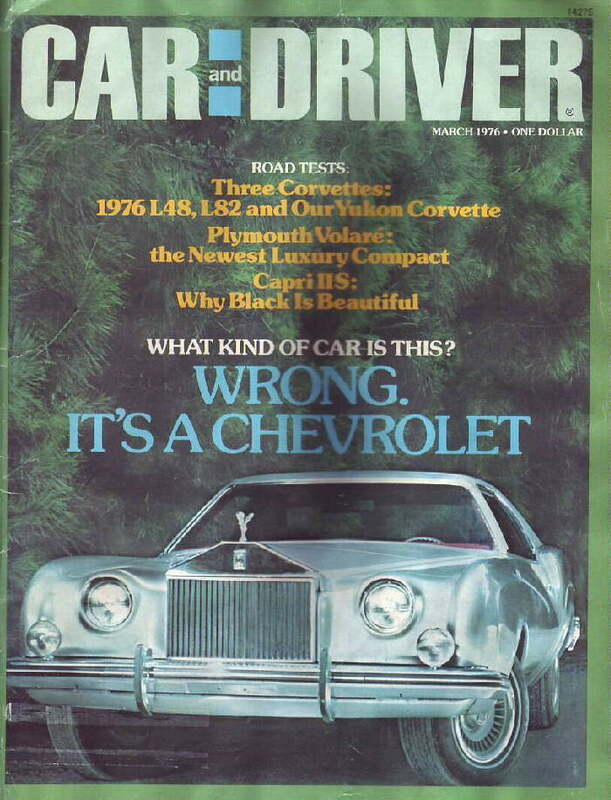 Here is the cover of Car and Driver for March, 1976. Note that the car pictured above has no turn signals below the bumper. That's because it is the same 1975 Monte Carlo that Jon bought to sculpture the parts on. The 1975 MC had no turn signals in the bumper, so the car above used the fog lights as turn signals. After this car was built, the 1976 models were available, which came with turn signals in the bumper. So the mold for the piece below the bumper was modified to allow the parts made from it to accept the turn signal lights that came in the bumpers of the new cars. The second car was built for the New York Auto Show, and Dean remembers finishing the car on the Sunday of the Supper Bowl of 1976, and shipping it off that Monday for the show the following weekend. That car show just happened to be visited by several Rolls Royce executives. When they heard about Jon's patent they became outraged. So, Rolls Royce soon started lawsuit proceedings against Custom Cloud Motors. Here's a picture of Jon standing in front of that second car, in his driveway. Note that Custom Cloud Motors stopped adding the fog lights, because now the turn signals were below the bumper. But, a lot of the cars built at Chevy dealers still included the fog lights, as you can see on this page. News of the pending lawsuit only made the Custom Cloud more popular. But, the curing time of the fiberglass parts was so slow that only two parts could be made each day from each mold. So, a boat making company was commissioned to build more molds and make the parts. New orders were coming in by the hundreds. The silver Custom Cloud pictured here in Dean's driveway was the third car assembled, and it was used as a demo. Dean drove it many times getting the kinks out, so-to-speak. He said the car sure did get the looks as he drove it around south Florida. There is a page available on the Internet that describes the lawsuit, titled: "Rolls-Royce Motors Limited, et al. v. Custom Cloud Motors, Inc., et al.," I will summarize that page in the box below. Rolls Royce brought a lawsuit in 1976 against Custom Cloud Motors of Florida, for distributing a fiberglass kit that was made to attach onto 1973 through 1976 Chevrolet Monte Carlos. The lawsuit also included Key Chevrolet, a dealership in New York that sold the Monte Carlos with the kits installed. The lawsuit claimed that the resulting Custom Cloud automobiles featured near-exact copies of the Rolls Royce hood, grill, "Flying Lady" hood ornament, and an insignia of the same layout as one for a Rolls Royce. Also, the plaintiffs claimed that the name "Custom Cloud" was taken from the name "Silver Cloud" which was a model of a Rolls Royce. District Judge Griesa found "without hesitation" that there was trademark infringement, and the motion of the plaintiffs for a preliminary injunction was granted, to be settled in one day's notice. As mentioned earlier, the taillights on the Custom Clouds were, in fact, the same ones used on the Rolls Royce cars. I found it strange that the lawsuit didn't even mention the taillights. I guess Rolls Royce really couldn't include that, because they got the lights from Lucas, and Lucas would only welcome more business and publicity. While waiting to see how an impending lawsuit from Rolls Royce left his company, Jon was planning on building a second knockoff kit car. That was to be a Mercedes 450 SLC replica, made from a Chevy Monza Town Coupe. He was hoping to involve other GM outlets, and then possibly, even other manufacturers with even more cars to be designed. Jon said that after the lawsuit proceedings began, the company was swamped with orders from Chevy dealers, and went into a 24 / 7 production cycle to get as many orders filled as possible. Eventually, there were over one hundred people involved with making the Custom Cloud kits. They were only able to produce 3 - 4 kits per day from their four sets of molds. They did this for about six months until they had to cease production. Apparently it took several months for the legal case to reach the court date. If you multiply 4 kits times 7days, times 26 weeks, you find that there couldn't have been many more than about 700 kits built before the court heard the case, and stopped the production. The number of kits built is not agreed upon by Jon and Dean. Dean remembers receiving only four deliveries of grill assemblies, and each delivery included 25 grills. He believes about 100 kits were built. Neither Dean nor Jon know how many of those kits became cars. But, we know it has to be a lot more than 14, as the ad below says (picture supplied by Joaquin Rivera). So, don't believe everything you read in the paper. You will see many more than 14 Custom Clouds, including the Classic Coach versions (which I'll explain next) right here. After Rolls Royce won the lawsuit, Jon Tedesco planned to continue making the cars by doing some very subtle changes to the Custom Cloud. First he renamed the car a Classic Coach. 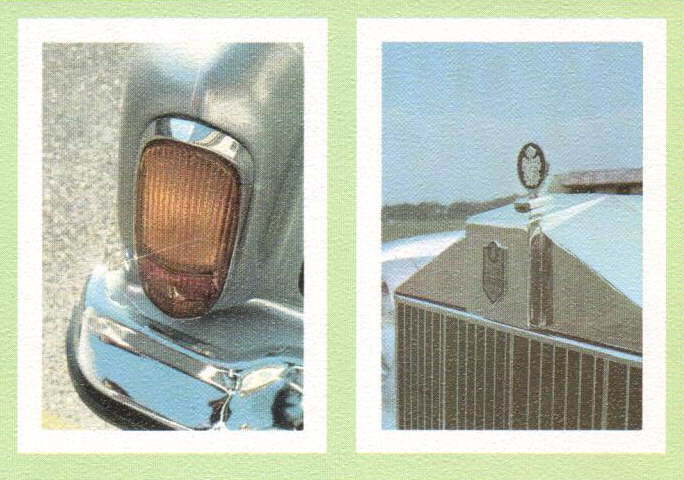 The flying lady hood ornament was replaced with a standing disc ornament, and the CC insignias were replaced with crest insignias that had no similarity to any Rolls Royce insignias. Some owners were sent the new hardware and told to return the offending emblems. Jon Tedesco told me that the changes to the car to make it a Classic Coach were acceptable to Rolls Royce, and production of the cars could continue. Here you can see the new emblems. Also, you will notice that the taillights had been changed on the Classic Coach version. The top of the revised grill sloped down to the front and protruded in the center. The last change made to the cars was to have the parking/turn signal lamps moved up onto the fenders, outside of the headlights You can see that right here. But, Lenny pulled out of the venture after Rolls Royce won the lawsuit, and eventually the company was sold. Here you can see a letter dated in March of 1978 when the kit-car project was sold to the Classic Coach Motors division of United Auto Sales. Both Jim and Jon supplied me with some original Custom Cloud/Classic Coach ads. Jon's not sure how many Classic Coach kits were produced with the approved changes. Even now, Jon admits the Custom Cloud was the most fun project he has ever worked on. I moved on, and went back into the jeweler manufacturing business in Cincinnati Ohio. Then, I moved to Thailand in 1985, starting my own jewelry factory. I also started making custom highly-polished laser-cut side pipe shields for Corvettes and Cobras. I have a license from GM to use their copyrighted names on the Steel Shields. To this day I always have found memories of the Custom Cloud. I am grateful to have had a friend in Jon Tedesco. He sure was a truly creative person that never gave up. When Jon moved back to California I lost track of him, and once in a while hoped to, some day, catch up and reminisce. After all the publicity of the Custom Cloud, Cadillac executives asked Jon if he could help design a uniquely modified Cadillac for them. The result of this effort became the Pierre Cardin Cadillac. This was the origin of Standard Motors, Inc., the company from which United Auto Sales bought the Classic Coach operation. In 1979 Jon moved to California. All his family's possessions were loaded onto a large moving truck, and he and his family flew there in a plane. After a week went by, Jon called to find out where his truck full of stuff was. The truck never made it out of Florida. While crossing a bridge, a car struck it at the fuel tank, starting a big fire. On board the truck was another custom car that Jon had built just for himself. When the fire reached the fuel tank of that car, the fire grew even bigger. All of the Tedesco's possessions burned up in that fire. The fire even burned a hole right through the bridge, and the driver of the car that caused the accident perished. A lot of pictures and other memorabilia of the Custom Cloud burned in the fire. That event ended Jon's working on car projects. Jon spent about ten years working with Art Linkletter, and he also partnered with the creators of the George Foreman Grill. With them, he invented and patented a cooking appliance that produces nonfat crunchy snacks. It is a process of cooking with hot air, similar to popping popcorn, but providing more tastes, ingredients, shapes, and textures. That started a new company called Munchables Inc.
After Jon got a little more gray hair on his head, he turned his attention to the needs of baby boomers. Since then, Jon has been working on new medical delivery systems, prevention, wellness, and anti-aging projects, in a new public company. Jon sent me some pictures of some adventures he had after the Custom Cloud. A Custom Cloud is a much lower, sleeker car than the Rolls Royce that it emulates. But, it wasn't really fashioned after any particular model of Rolls. And, it's really hard to recognise as a Chevy, because the only Chevy parts exposed on the outside are the doors, windows, roof and back bumper. The front clip (the front fenders, front bumper, hood, headlights, and grillwork) of a Monte Carlo was removed and all new pieces installed. The existing deck lid was removed, and new quarter panels, connecting pieces, and a new deck lid were mounted over the existing back of the Monte Carlo. Some conversions reused the original Monte Carlo front bumper, but the 1973 Buick LeSabre front bumper (most often used) made a much better looking car. Although the Custom Cloud kit was made to fit any 1973 through 1977 Monte Carlo, I think most all of them were installed on new 1976 cars. As I said earlier, no one knows for sure how many Custom Clouds or Classic Coaches were built, or remain to this day. But, you can view plenty of them right here. The unusually low quantity produced could explain why I never heard of the Custom Cloud until I saw the one I bought. Most of you will never see a real one, just pictures. But, here, I'm daring to use the word "real" when it's really just a fake, right? But, in this case, the fake is better looking, and much more rare. It may interest you to know that you can still get a Rolls Royce-looking kit on your car if you own a current model Chrysler 300 or a 1998-2006 Lincoln Town Car. Just visit luxurykit.com. The Custom Cloud that Charlie Wolters restored.